Powered by Frooition Shop Categories BraceletsDiamondGemstonePearl FashionMoissaniteCharm BraceletsGold, Silver PlatinumOtherCharms DanglesClearanceEarringsDiamondGemstonePearlForever Brilliant MoissaniteBirthstone EarringsGold, Silver PlatinumEngagement RingsSolitairePlatinum BridalThree-StoneForever Brilliant MoissaniteGuards, Wraps and EnhancersDanhovFamily JewelryBraceletsEarringsNecklaces PendantsPosh MommyRingsYouthNecklaces PendantsDiamondGemstone NecklacesPearl FashionForever Brilliant MoissaniteBirthstone NecklacesHershey's KissesMonogram Nameplate JewelryChain CordGold, Silver PlatinumReligious SymbolicBraceletsBrooches PinsDiamond PendantsEarringsFashion PendantsGemstone PendantsGold PlatinumMedalsPatrioticRingsRingsDiamondEngagement RingsWedding BandsGemstoneGold, Silver PlatinumMoissanitePearlPromise RingsStore HomeView All ItemsWeddingAnniversary EternityMen's BandsDanHov Fashion Hinged Bangle Bracelet In Sterling Silver Item Description Sterling Silver 8 Inch Link Bracelet With Toggle Clasp. 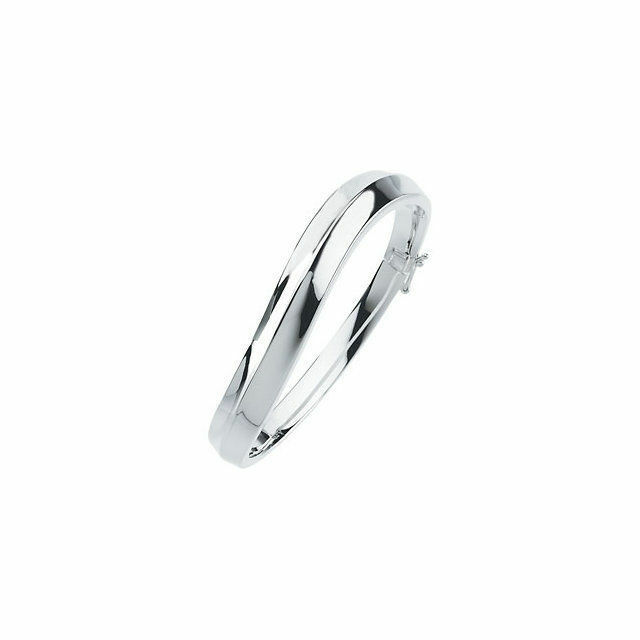 - See more at: http://www.icecarats.com/Sterling-Silver-8-Inch-Link-Bracelet-With-Toggle-Clasp-122412.aspx#sthash.UChHAC5j.dpuf A brand new ladies 0.925 sterling silver 10mm hinged bangle bracelet. A bagel bracelet, usually made of metal, wood, or plastic, are ridged and do not bend. They make perfect gifts for birthdays, graduations or any special occasion. Sterling Silver 8 Inch Link Bracelet With Toggle Clasp. - See more at: http://www.icecarats.com/Sterling-Silver-8-Inch-Link-Bracelet-With-Toggle-Clasp-122412.aspx#sthash.UChHAC5j.dpuf Sterling Silver 8 Inch Link Bracelet With Toggle Clasp. - See more at: http://www.icecarats.com/Sterling-Silver-8-Inch-Link-Bracelet-With-Toggle-Clasp-122412.aspx#sthash.UChHAC5j.dpuf Specifications Weight: 36.20 grams Jewelry Material Type1: Sterling Silver Metal Purity1: .925 Metal Color1: White Bracelet Width: 10 mm Diamond carat weights (CT.) represent the approximate total weight (T.W.) of all diamonds in each setting and may vary no more than .07 below the stated weight. Typographic errors are subject to correction. About Us About Us Payment Shipping Returns Contact us About Us JA Diamonds is a online jewelry retail store that offers a huge selection of wedding bands, engagement rings, promise rings, necklaces, earrings, bracelets, religious and loose diamonds. We know that offering fine jewelry at a great price is only part of the story. Our website offers an education page where you can learn more about jewelry. At JA Diamonds, we proudly stand behind every item we offer and we deliver unparalleled back end customer service and assistance. And with our 100% satisfaction guarantee, you can buy with confidence knowing that all of our quality items are real and authenticated. We take our customers satisfaction very serious and will be more than happy to answer any questions that you may have. Whether by phone or email, we remain committed to providing our customers with the stellar service and satisfaction they deserve. We will be continuously adding more items to the website so please visit us regularly. Payment Payment At the moment JA Diamonds accepts Paypal payments. Your shipping address MUST match the billing address of your account. We can ship to a secondary address if you contact paypal and add a secondary shipping address. It is free, and only takes a few minutes to do. This policy is for your protection and almost eliminates the chance of credit card fraud. If you have any questions about making payment for any item don't hesitate to contact us. Shipping Shipping All items are shipped after payments are cleared. Most of our items are shipping on the same day. However, if your order is a special order or requires resizing, it may take up to week to have it ready. All orders within the United States are shipped free. All items over 500 are also shipped free and require signature. Please receive up to 4-6 business days to receive you item after we ship it. USPS tracking numbers can take up to 48hours to be updated so please remain patient it your tracking number does not show any changes. However, if you have any concerns regarding your shipment please don't hesitate to contact us. International buyers, please remember that we are not responsible for any customs or duty fees imposed by the buyer's country. Returns Returns At JA Diamonds your complete satisfaction is important to us. If you're not 100% satisfied with your jewelry purchase, you may exchange or return the merchandise for a full refund. You must return items in new or unused condition. This means that there are no scratches, marks, blemishes, nor any other damage(s) on the item, and that it has not been sized or altered in any way. Once merchandise is received a refund will be issued within 48 hours. Money is refunded the same way it was received. Refunds on purchases made with a credit card will only be credited to the same card. Contact us Contact us You can reach any of our staff by sending us a message through. We will be very happy to assist you! HOURS OF OPERATION Monday - Saturday: 9am to 7pm CST Sunday: Closed - Family Days Helpful Links Add to Favorite Sellers Sign up to Newsletter View Feedback Contact Seller Visit seller's Shop About Seller Page More Items! View more great items Powered by Frooition Frooition Frooition No-js Template design, store design, shop design, template design, listing design (ver:froo_no_js) This listing is currently undergoing maintenance, we apologise for any inconvenience caused.